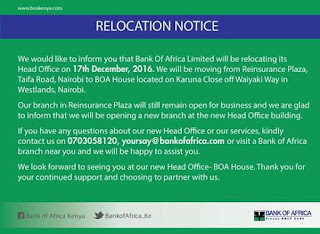 Bank of Africa (BOA) on 17th Dec,2016 officially will relocate its headquarters from Reinsurance Plaza along Taifa Road to its own branded BOA House on Karuna Close off Waiyaki way in Westlands,Nairobi. 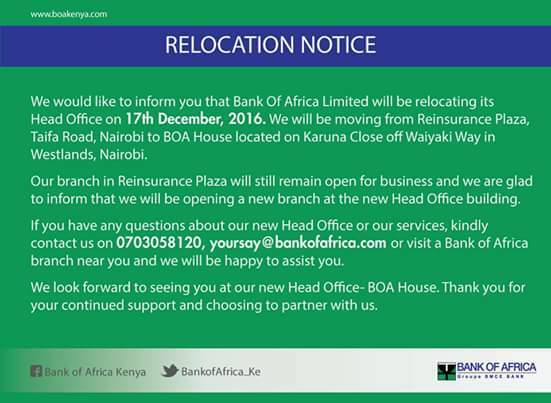 The lender with 42 already operational branches countrywide will be adding welcoming BOA House branch and Head office as the 43rd. After the bank headquarters relocation mid December, the Reinsurance Plaza branch will still be open to customers but just as a normal branch. 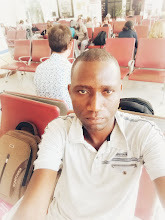 BOA has joined the likes of Cooperative bank,Equity bank,Kenya Commercial Bank(KCB) and Family bank in housing head offices under own branded plazas in Kenya.